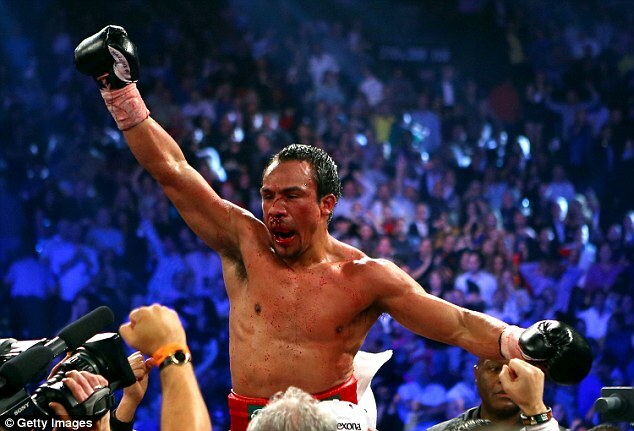 LAS VEGAS -- No need for Juan Manuel Marquez to impress the judges. No need for the referee to count to 10. 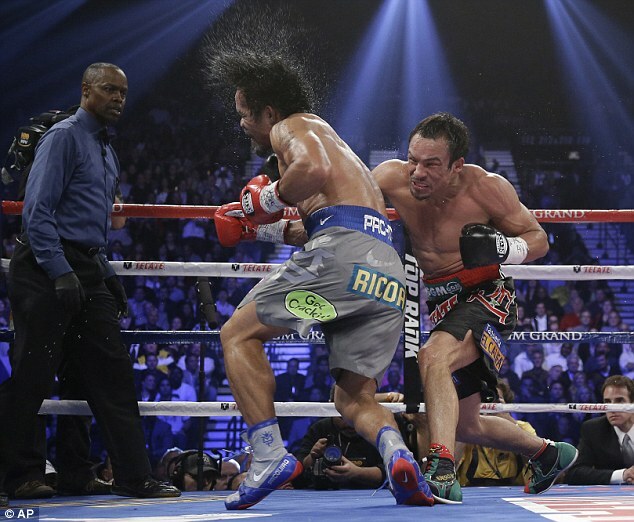 Marquez took care of all of his business Saturday night with a thunderous right hand that left Manny Pacquiao face first on the canvas with his remarkable career in question. 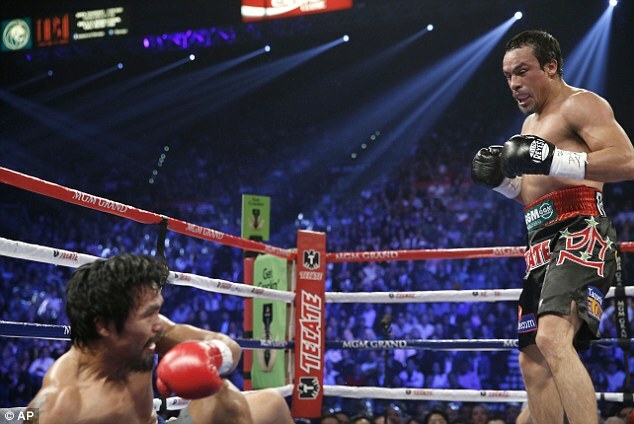 Unable to win a decision in their first three fights, Marquez won the old-fashioned way with a huge right hand that put Pacquiao down for the second time in the fight at 2:59 of the sixth round. Referee Kenny Bayless never bothered to count as Marquez leaped into his handlers' arms in celebration and Pacquiao's wife broke into tears at ringside. 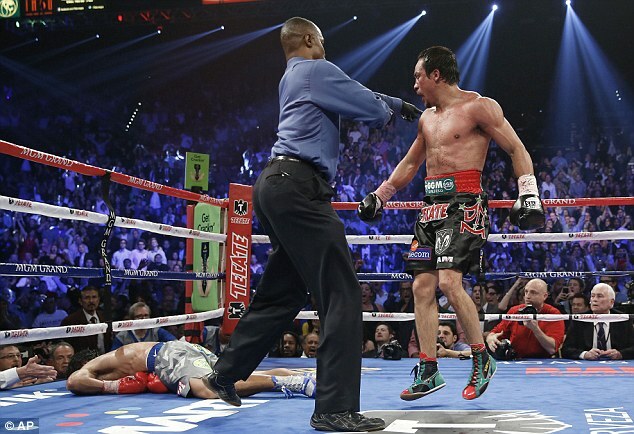 "I threw a perfect punch," Marquez said. "I knew Manny could knock me out at any time." It was a stunning end to a thrilling fight, the fourth one in the last eight years between the two men. It could also be the end of the Filipino's career, though he said in the ring afterward he would like to fight Marquez for a fifth time. 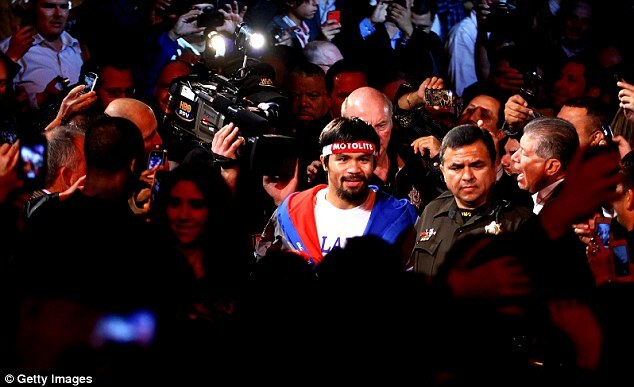 "If you give us a chance, we'll fight again," Pacquiao said. "I was just starting to feel confident and then I got careless." Pacquiao had been down in the third round but knocked Marquez down in the fifth and the two were exchanging heavy blows in the sixth round before Marquez threw a right hand that flattened Pacquiao face down on the canvas. 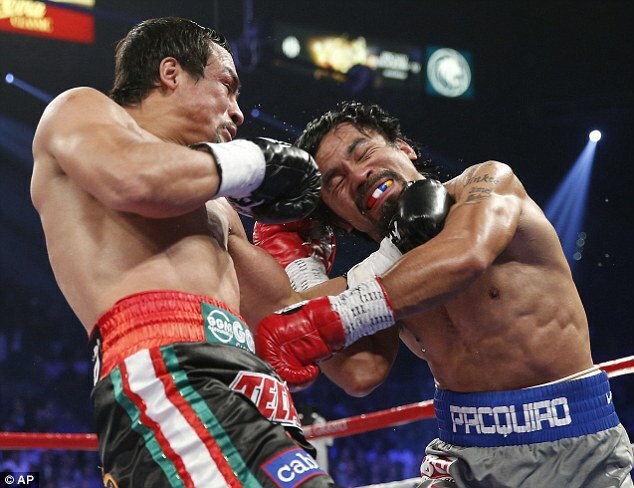 "I thought I was getting him in the last couple of rounds but I got hit by a strong punch," Pacquiao said. "I never expected that punch." 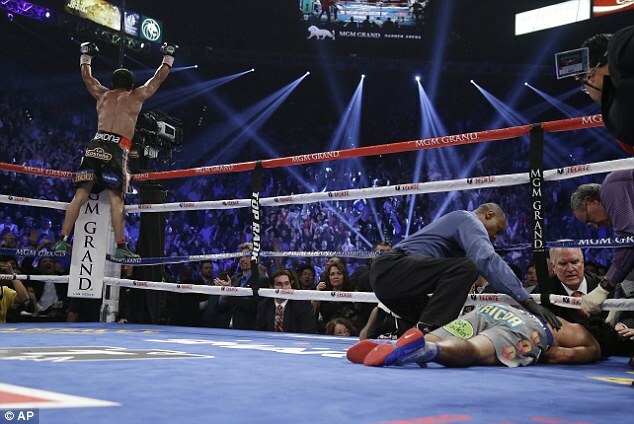 Pacquiao was down for about two minutes before his handlers managed to get him up as Marquez celebrated and the sold-out crowd at the MGM erupted. After being helped to his corner, Pacquiao sat on a stool, blew his nose and stared vacantly ahead as his handlers cut his gloves off. 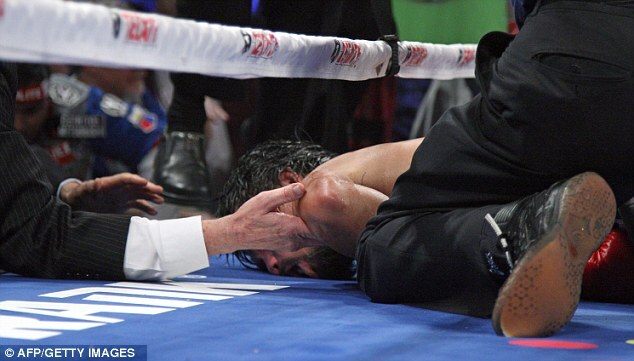 It was a stunning end to a furious fight, and Pacquiao was later taken to a hospital for precautionary examination. "We always worked on that punch," Marquez said. "We knew he was going to come out aggressive so we had a fight plan that was more technical. We were able to capitalize on it." 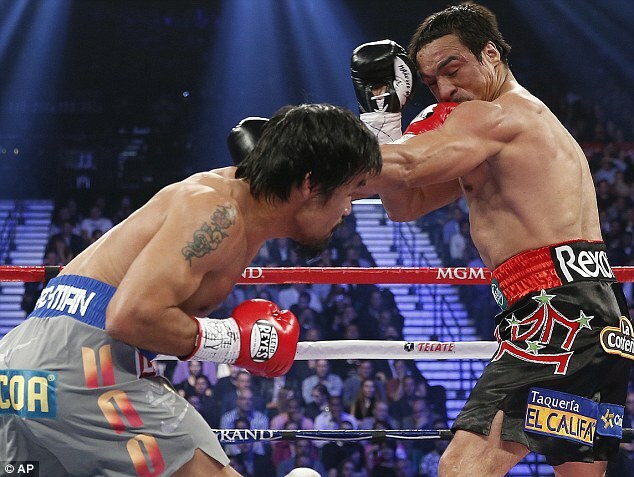 Marquez had vowed to finally beat Pacquiao after losing two close fights and settling for a draw in the first fight. But after Pacquiao knocked him down in the fifth round and was landing big left hands, it looked like it would be Pacquiao's night. The two came out for the sixth round and the pace was just as relentless. 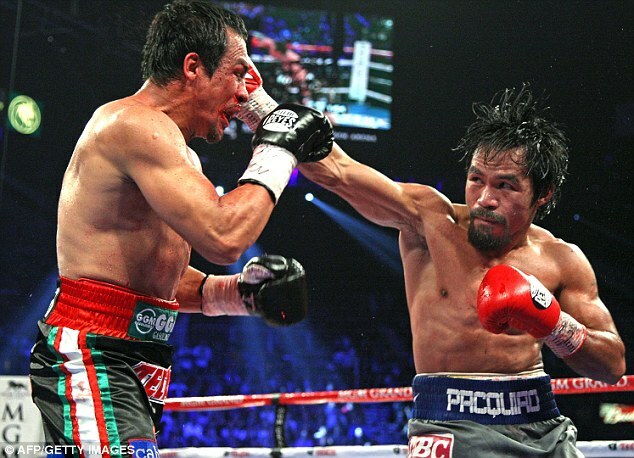 Both were landing big punches and both were brawling when suddenly as the round came to close Marquez shot out a right hand that landed flush to the jaw of Pacquiao, who crumpled to the canvas in a heap. 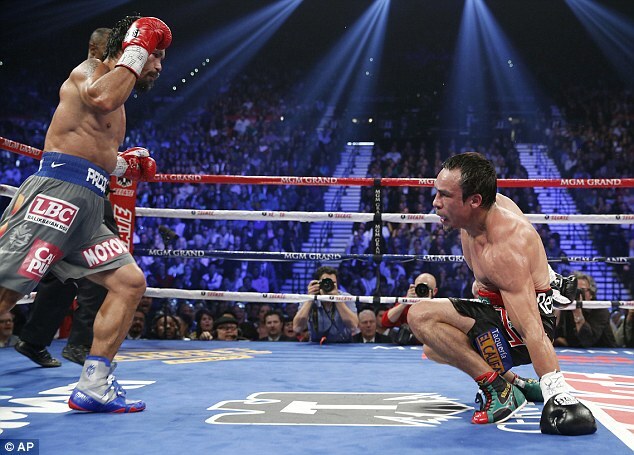 "I felt he was coming to knock me out the last three rounds and I knew he was going to be wide open," Marquez said. It was the second loss in a row for Pacquiao, who dropped a decision to Timothy Bradley in June and who had vowed to regain his prominence in the ring. 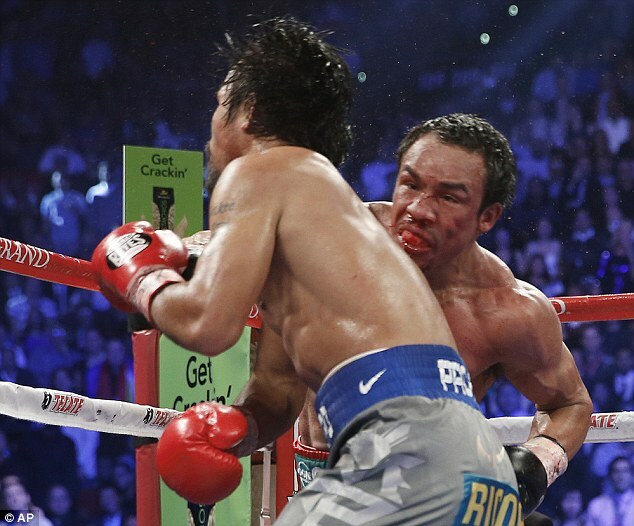 Pacquiao was aggressive from the opening bell, but paid the price in the third round when he got caught by a Marquez right hand that put him down. 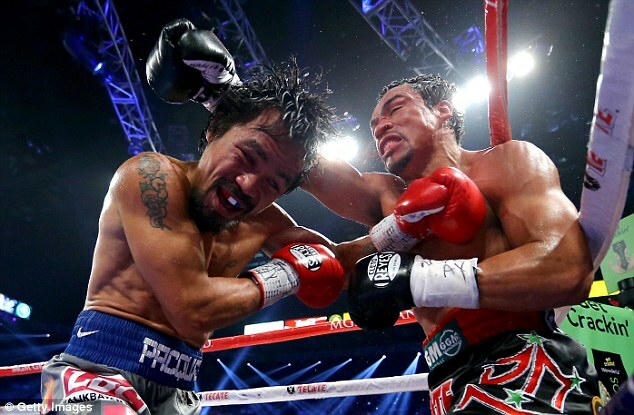 Pacquiao got back up and seemingly took control of the fight, dropping Marquez in the fifth round and landing the bigger punches until he was dropped. 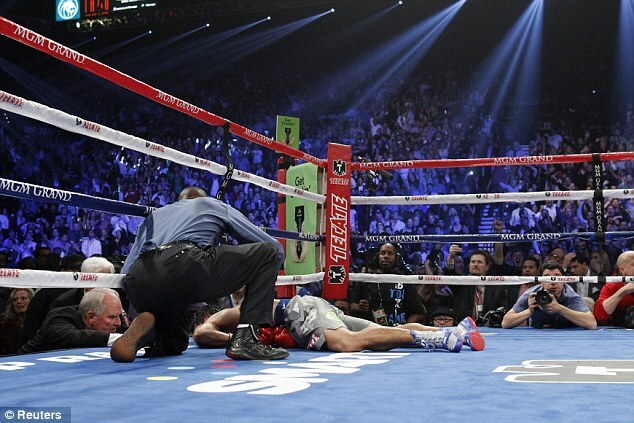 "I got hit by a punch I didn't see," Pacquiao said. Pacquiao, who earned more than $20 million for the fight, was ahead 47-46 on all three scorecards after the fifth round. There was no title at stake in the 147-pound fight, but that didn't stop 16,348 fans from filling the MGM Grand Arena and roaring in unison from the opening bell as the two fighters went after each other. Ringside punching stats underscored the ferocity of the bout, showing Pacquiao landing 94 of 256 punches to 52 of 246 for Marquez. But it was the one big right hand from Marquez that counted more than anything, knocking Pacquiao out for the first time in a career that goes back 17 years. 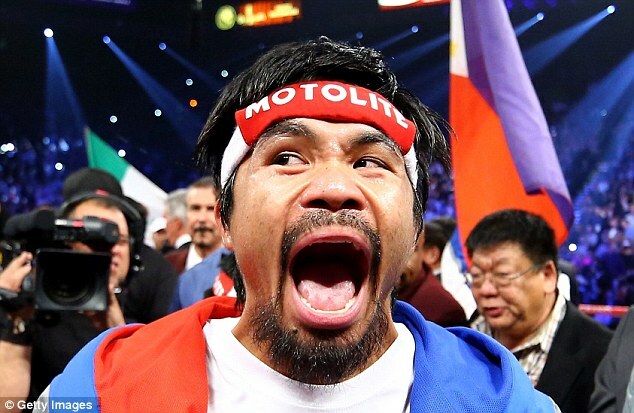 "He was in charge," Pacquiao's trainer, Freddie Roach said. "He just got a little too careless and got hit with a punch he didn't see." Promoter Bob Arum immediately said he could see a fifth fight between the two boxers, and a dazed Pacquiao seemed to agree. Pacquiao weighed the class limit of 147 pounds, but it was Marquez who looked like the stronger fighter entering the ring after having bulked up with the help of a strength conditioner, though he weighed in at 143 pounds. In their earlier fights, Pacquiao had been the bigger puncher, knocking Marquez down a total of four times, but on this night it was Marquez who had the biggest punch. 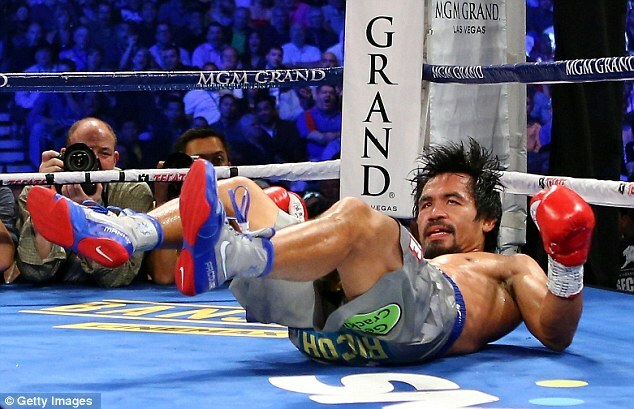 The stunning knockout was the first real loss by Pacquiao in seven years. He lost a close decision to Bradley in his last fight, but most ringside observers believed he had won it fairly convincingly. 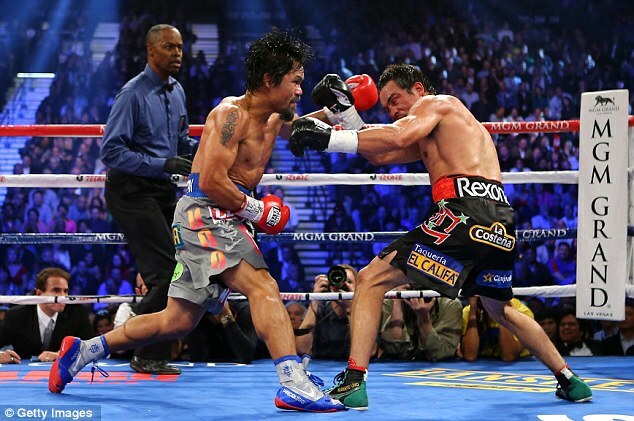 Marquez improved to 55-6-1 with 40 knockouts, while Pacquiao fell to 54-5-2. 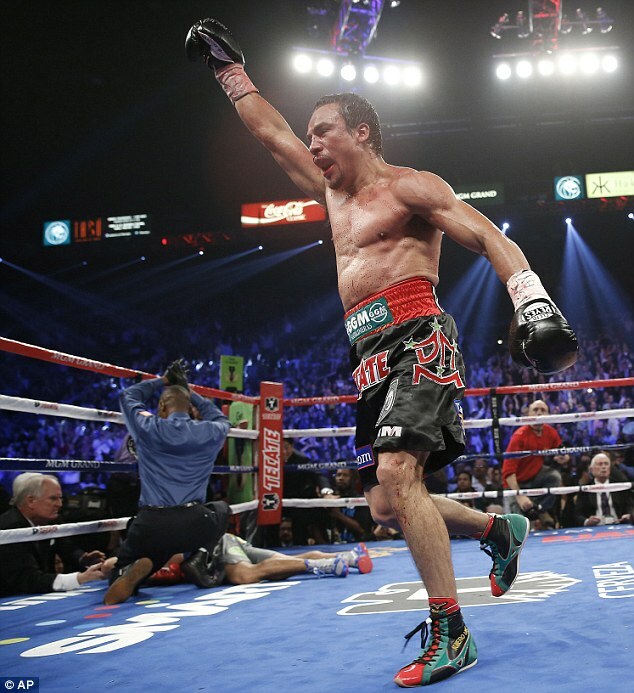 Juan Manuel Marquez avenged his two previous defeats to Manny Pacquiao by producing a devastating sixth-round knockout in Las Vegas. Both men touched the canvas early in the fight, however it was Mexican veteran Marquez who ended the fight in style with a crunching right hand over the top at the end of the sixth. It was a stunning finish from Marquez, who had been dropped in the fifth round himself after Pacquiao caught him with a powerful left. The victory improves Marquez's record to 55-6-1 and leaves Filipino former welterweight king Pacquiao's career in major doubt after back-to-back defeats. The previous three encounters between the two welterweights had not been short of controversy with decisions disputed, but there was no doubt about this one. 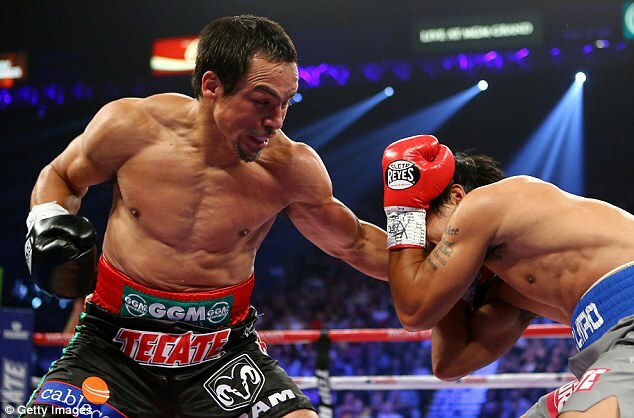 After two cagey rounds, it was Marquez who landed the first telling blow in the third. A big right-hander sent Pacquiao to the canvas and, though he bounced straight back up again, it was clear the Filipino was rattled. A high-octane and even fourth followed, but in the fifth it was Pacquiao who stepped up a gear, landing a big left jab on Marquez, who touched the canvas with his glove. With Marquez cut and hurting, the 33-year-old scented blood and pressed forward in the sixth. But in his haste to finish off Marquez he left himself open and the Mexican produced a thundering counter-punch which left Pacquiao face down on the canvas. Manny Pacquiao gives straight answers even after he’s been knocked cold in the upset of the new century, as he was by his perennial rival Juan Manuel Marquez on Saturday night. 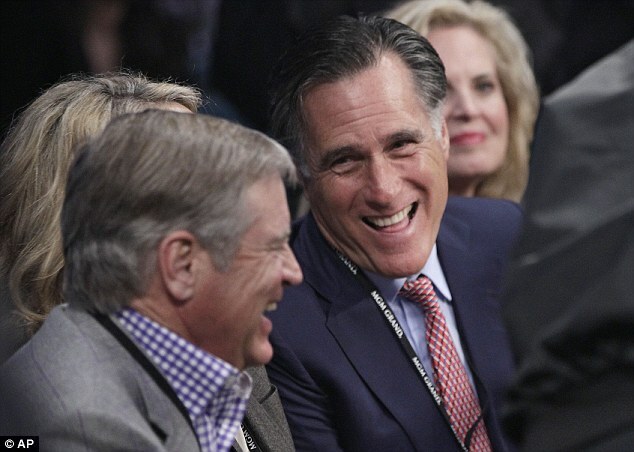 Why not, indeed, when the early returns from the fourth edition of this saga suggest gross takings of $85 million. Why not, now that this knock-out with one second remaining in the sixth round has almost certainly put paid to the even richer prospect of a dream fight between Pacquiao and Floyd Mayweather. The question which remains unanswered, however, is exactly how Senor Marquez, at the grand sporting age of 39, has developed a physique like the Incredible Hulk and nuclear power in his right fist. If the world were as simple as when we were starry-eyed kids, we would have awoken with an almighty hangover on Sunday morning after joining thousands of Mexicans in their tequila-soaked celebrations here. Instead we are walking gingerly on egg shells. The world is not so simple when the victor of what might well be voted the Fight of the Year has to keep denying that his body-building transformation has been achieved with the help of performance enhancing drugs. Marquez puts it down to incredibly hard work. We hear him but we also know that his physical conditioner is the man who confessed to supplying steroids to shamed US Olympic athletes Marion Jones and Tim Montgomery. It feels horribly churlish to withhold unqualified praise for Marquez’s achievement in flattening, at the fourth attempt, the Filipino idol who went into this tumultuous weekend as one of the two best pound-for-pound fighters in the world. But if you hire as your dietician Angel Heredia – or whatever he calls himself at the moment – you must know that you will invite suspicion. Everyone was dancing around the issue once Pacquiao was back on his feet and en route to hospital for precautionary tests. That much was obvious for all to see as Pacquiao was decked in the second round before being knocked head-first into oblivion at the end of the sixth. His wife Jinkee was in weeping distress at the sight of her husband lying prostrate under a rope but once her husband had been revived he consoled her on his way to congratulating Marquez. He remains a gentleman in defeat – and arguably still the greater boxer than Marquez even though the clear and decisive outcome which both sought in this re-re-re-match went to his nemesis, not himself. Pacquiao, with his crisp right jabs, in-and-out attacks and whiplash lefts controlled this fight with the exception of taking those two huge blows. 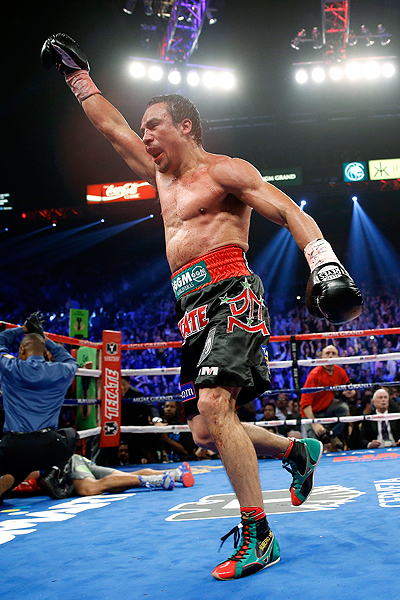 He recovered from his first knock down to dump Marquez on the seat of his pants in the fifth. For the most part Pacquiao dominated from his quick-fire response to the first bell until that single second before it would have rung to end the sixth. 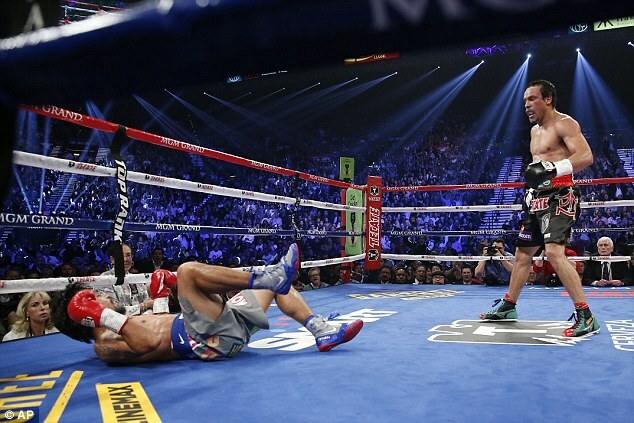 Marquez, his nose broken and his face lacerated, was on the brink of defeat when Pacquiao sensed a KO of his own, became over-excited and walked onto his opponent’s desperation punch. Marquez was also showing signs of concussion when he returned to the dressing room and he, too, had to go to hospital. With both men determined to bring their dispute to an abrupt and finite conclusion, promoter Bob Arum compared this with the historic battle between Marvin Hagler and Thomas Hearns which is regarded as the greatest three rounds in ring history. Arum is probably right in arguing that Mayweather-Pacquiao could still be a $200 milllion pay-TV bonanza. As he says: ‘Losing a fight, even by knock-out, is not death.’ The problem is that Mayweather now has the perfect excuse for declining to put at risk the unbeaten record he cherishes. He did, after all, defeat the pre-muscular Marquez quite comfortably a couple of years ago. 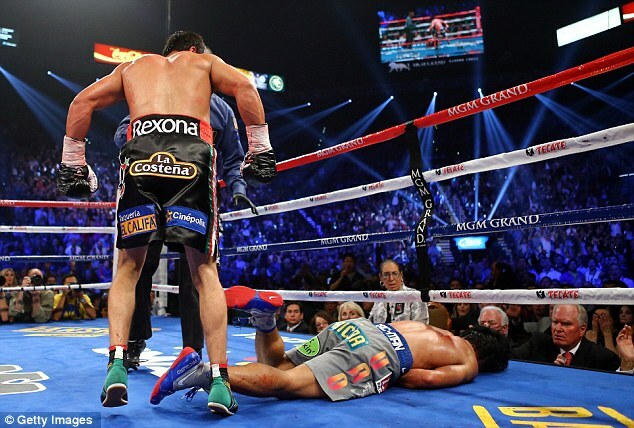 Pacquiao-Marquez Five is another matter. The series continues to court the kind of controversy which, along with the intensity of the fighting, makes for good box office. Marquez bitterly protested the results of their first three contests, a draw and two narrow decisions in favour of Pacquiao. Now he finds his night of redemption clouded by insinuations of drug abuse. That will bring a sense of unfairness crowding in on him which will seem as over-powering as the roaring support he had in the Grand Garden Arena. This was the night which was supposed to resolve their personal dispute once and for all. Rather, it begs the question of a fifth encounter. One for which the preparations need to be monitored, by wicked irony, by the Olympic standard blood testing which a certain Mr Mayweather is campaigning to make mandatory in boxing. So when will it all end? The PacMan may have to answer that, too. Whenever he decides to retire into politics full-time.